Tattingstone Remembers . 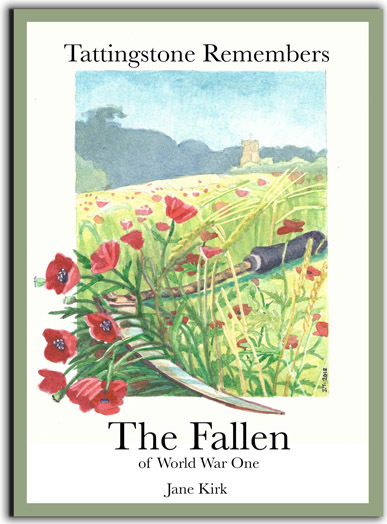 . .
Jane Kirk's series of stories about the fallen of the Great War with associations to this village has been a feature of the Tattingstone News over the past four years, with each anniversary of the men's death being honoured in this way. Now, with the centenary of the armistice upon us, Jane has collated these stories and added a lot more details in a new book entitled 'Tattingstone Remembers The Fallen of Word War One'. Everything about the book, apart from the actual printing, has been Made In Tattingstone, from the editing and publishing, through artwork and poetry to contributions from as wide a spectrum as the local primary school children to a former Poet Laureate - all Tattingstone connected. There is even mention of our residences in their former life as the Samford House Of Industry, including the contribution it made to the war effort, alonside other social history information and photographs of the village at the time.